...ravings from the Shell... | ramblings from a digital fossil in an (un) wired world. It begins with a message in the previous Autumn. “Keep Easter free”. Followed soon after by “Can I book you for the Watersides?” That’s when you know she’s found an idiot someone prepared to paddle 125 miles, stop 77 times, pick up the kayak, carry it around a lock get back in and paddle on, all in (hopefully) around 24 hours. So sometime in November or December you meet up for a training run, find out what they eat. OK, two vegetarians, that simplifies things. But. One is very finicky, however the other is military and will eat anything you stuff in their mouth. (Pro-tip: if they are eating at a portage they can’t be telling you off. However, beware of getting bitten). You start to learn to judge their moods when they are cold wet and tired, find out how to motivate and lift them. And you learn all the back roads and sneaky parking places along the Kennet & Avon from Devizes to Reading and the Thames from Reading to Richmond. Heck, after Richmond they just woosh down on the tide and all you’ll have to do is wave from a few bridges. Easy. Well that’s the theory. Winter is wetter than average, flow is higher than average, The first warm-up (yeah warm? in January?) race isn’t a Waterside it is the Frank Luzmore Memorial Marathon from Weybridge to Richmond and the river is pelting, so they make a very nervy start, you can see the rear-end of the kayak wobble as they paddle off. It’s a short race, 13 miles, so just one feed at Moseley lock. The river is high, they have to wade out through the shallows to put in. Some faffing ensues before they make off. Traffic is terrible, horse riders at Hampton Court and shoppers at Kingston, they have already got out at Richmond as I arrive. “Did you see that finish? It’s totally bonkers out there”. “Erm, well, no”. That’s my bacon butties point well and truly in the negative. And we have barely begun. So on through February and March, the Waterside series of races, each longer than the last on the Kennet & Avon, and the Thamesides (no that wasn’t specifically mentioned in the original booking, it was implied – read the small print). Ideally you’ll have at least four road crew in two cars so you can leap-frog, share the load and reduce the risk of losing the kayak, so as the races get longer the team gets bigger. This is where the Canoe Supporters Union (CSU) come in. (Motto: “Where are the bacon butties?”) Now you have someone who can navigate help you get lost, scribble down the times. Oh yes. The times. Splits. Deltas to the intended schedule. Got to note all that. And afterwards, the de-briefs. the points-out-of-ten for the feeding, drinks & kit changes at the portages. 77 Portages. A minute lost at each is more than an hour on The Day. (and Night). And don’t forget to take photographs. (Pro-tip: take a picture at the portage and get the split time from that – 2 avians with a single geological projectile). It’s getting close and there are still only three in the road crew, really need to find a fourth. Ideally a paddler, and ideally a female. and ideally along comes Naomi, who is a damn fine paddler, and female. But she is competing in the Watersides, so for some support practice we meet up for a paddle from Marlow to Royal Canoe club near Hampton Court. So they paddle off, we meet & feed them at Bray, and using local knowledge I bypass the Sunday Windsor traffic jams, so we have a long wait at Old Windsor. Sitting, waiting. Someone approaches the car. “Are you waiting for rescue?” “What?” “Your rear tyre is flat” “******* *** ******* *****”. No spare tyre, just a can of squirty stuff. Tyre doesn’t inflate. It’s a big hole. a BIG. Hole. Feed the paddlers call out the AA. AA man gets me to kwik-fit just before they close at 16:00. The weather isn’t great, and the paddlers have decide to cut things short at Shepperton. JJ in the other vehicle meets them at Shepperton. We have their dry clothes. By the time we get to Shepperton they are a bit miffed. And a bit cold. Lesson: both cars should have dry kit. So. The race itself. On the Friday Car 1 with Sarah & Woo the paddlers, JJ & Brian supporting go down to be billeted in Devizes for the early start. Naomi & I meet and stay in Fleet. Naomi doesn’t drive so the plan is I get a bit of extra rest and we catch up with them a couple of hours into the race. But we are too hyped so start out fairly early anyway and get to see them through Wootton Rivers, before scooting off to do our first feed at Crofton. However. Parking at Crofton has been restricted to a rather wet field opposite the beam engines, and the car has traction issues even getting into the field. Grrrrreat. At least we do now have a proper spare tyre. Woo needs blisters on her hands taping and Sarah is on the painkillers. It’s a bit early to be patching them up. Quick dash to wave them by at Great Bedwyn, then rather more leisurely on to Dunmill beyond Hungerford. No more medical issues, they are more-or-less on schedule, or at least within parameters, so it is all going rather splendidly. Naomi & I next catch up with the boat at Marsh Benham, then trundle off to Thatcham, where according the the instructions we were given, we cook up a hot meal. OK. Cook is a bit misleading. Woo has procured some military self heating meals. All you do is open the outer bag, add a small amount of water, this starts a reaction with some chemicals and that heats the inner bag of food. Takes 12 minutes. Naomi has been “cooking” while I’ve been driving. Some “discussion” takes place as the paddlers seem to forget that this was a scheduled hot food stop. At least Naomi & I have some hot left-overs to eat as we drive off to the next rendezvous at Sheffield lock. Nearly half-way there, pretty much on schedule to hit the tide window at Teddington, it is all going rather splendidly. Now comes quite a long stretch with limited support as the good Burghers of Sonning and Shiplake dislike disruption by all those awful people, so the next supported stop is Marsh Lock (Henley) which JJ & Brian are going to, whilst Naomi & I are off to Hambledon. Naomi & I decide to hunt for co-codamo tablets which leads to a navigational irregularity and a surprised JJ as we pass them gong the wrong way. Well reader, one learns. Co-codamol are not stocked at Petrol Stations (it’s now 9 PM) so we dive into Sainsbury’s outside Henley only to find the pharmacy is closed. On our way out we bump into Rob who was in the back the last time Sarah attempted this. He is supporting another crew. At Hambledon the car park is a long way from the river and it’s an even longer trek across the weir to the lock. At the lock I realise I forgot the tepid chocolate. Leaving Naomi, I scurry back to the car and decide to drive up the road and join the chancers on the double-yellows. Back at the lock I’m relieved to find they haven’t been through yet. When they appear it’s the routine of uncold drink and nibbles. they paddle off, mood a bit subdued. They are now onto the section through to Hurley where Sarah’s shoulder gave up in ’13. We drive to Marlow and park up in a back street near the river, there is a pub down the road and a church hall with a function on. I could probably have gotten closer to the lock. A lot closer. We start brewing more hot water and hot chocolate, and what initially sound like a drunk comes along and starts talking to Naomi. I bravely ignore him on the basis that if he is a fighting drunk he is less likely to get surly with a young woman. After a while I realise it is actually a taxi driver waiting for some wedding guest at the reception in the Hall. We try and explain the event to him but he doesn’t really get it. His fare come o and we pack up the hot drinks and quick-step to the lock. Somewhere here is Woo’s brother. I have never met him, so I keep a lookout for someone bewildered. I see someone bewildered and approach them. Bulls-eye. There’s a continual stream of people coming through, and I’m quite tense remembering the wait in ’13 before having to call race Control and retire them. But eventually they appear having Woo’s brother there is a nice change-up for them. And it’s back to the car and off. Our next appointed meeting is Dorney, but I spend some time trying & failing to find a parking space in Cookham, in order to do a wave-by from the landing stage beside the Ferry pub. At Dorney it’s quite tight to park (all the boats are closing up as they all try to arrive at Teddington for the tide window) and it’s another long hoof to the river, where we nearly miss them time our arrival to perfection. They are rather subdued as tiredness and cold kicks in. I take some great photos with the IR adapted camera. However, I have the lens cap on. Schoolboy error. [Smug Mode broken] No support allowed at Boveney, so JJ & Brian will take Windsor Romney Lock while Naomi & I go on to Old Windsor and reminisce about our adventures with punctures. We get a call from JJ, it is about 03.30. They [The paddlers] are taking a break at Windsor. How long isn’t clear, we decide to stay put in case they set off again, nothing worse than losing a crew because you are going back-and-forth. We settle down under blankets and coats, there’s a lot of car lights from the other support crews, we draw our hats over our eyes to get some darkness. Later it gets cold, I turn the engine on. We wake to a weird empty world. All the other cars have gone we are alone. Call JJ they are still at Windsor and unlikely to move. So we drive off to find them. This feels like end-game. I drive down to the boat-yard beside the lock. JJ’s car is parked up close to the river, Woo & Sarah are inside in survival bags and all their clothing JJ & Brian emerge from an outbuilding. Apparently there had been some sickness and they are both very cold. They’ve been parked up close to the river to avoid disqualification. Not clear if they had eaten something that disagreed with them had too much River water. When they wake Sarah looks like death warmed-up, but Woo’s military kicks in to full leadership mode, lots of jumping around and running on the spot to warm up, and with (quite a lot of) gentle encouragement they paddle off after a brief breakfast. Both cars go to Old Windsor in case they decide enough is enough, but they are now back in the zone. At Old Windsor is a bored Marshal and we let him know they are back on the river. It is a lovely morning, pale spring sunshine, still air. JJ & Brian take off to cover Chertsey so Naomi & I go to Penton Hook, where the crew announce they’ll portage along the towpath for a while as a break from paddling. They seem in good spirits as we leave them trotting along. Arriving at Shepperton we find another kayak laid up and the crew asleep in a car, before getting a call from JJ to warn us about an impending storm which breaks as the boat arrives. We all take shelter beside the bins at the toilet block – they found this hide-out on our unfortunate training run. The rain eases and they depart. At Moseley lock we run into some people from the BCCC club – the Endeavour stage-racers are starting to come though, and we are somewhat surprised by their arrival on the tow-path, having been unnerved by an experience with a floating gin-palace manned by Hullabaloos, such are the hazards of an Easter Sunday on the River. They carry on on foot, and we go in search of food, it’s 12.30 and this wasn’t in the plan. And it is Easter Sunday which is one of those rare Sundays where most shops are shut, but there’s a Sainsbury’s local near Teddington that is open and we can re-supply. They are going to be too early at Teddington for the tide-window so will have to wait. I call race-control for advice on where they can leave the boat whilst they take a break at the Young Mariner’s center where the Endeavour stage race is finishing for the day. I’m also trying to trace the other support crew. Original plan was for a night feed at the Royal Canoe Club on the other side of the river, but (we thought) that was clearly changed to meed them at Teddington. JJ 1 claims to have been sleeping parked up at Royal. They arrive to meet the boat which gets stowed on the towpath where the marshals can see it from their location by the rollers at the lock and we walk up to the Young Mariners so they can change kit, feed rest and warm up. 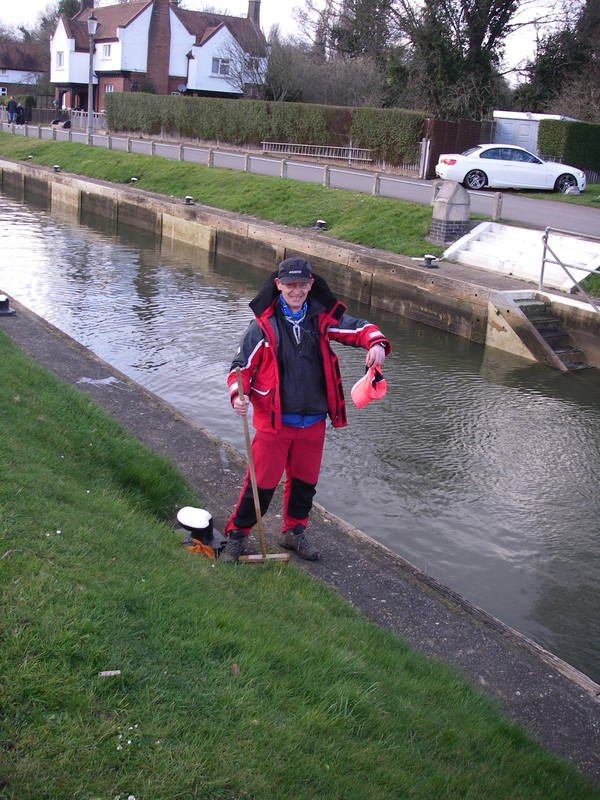 Woo’s favourite pink cap blows off into the lock. JJ makes a point of rescuing it. It don’t realise the significance till much later. Brian is fretting as due to family commitments he can’t continue. sandy, Woo’s friend arrives to meet up. She’ll take Brian home. News comes through that due to an impending storm with near hurricane force winds the Endeavour race will finish here. 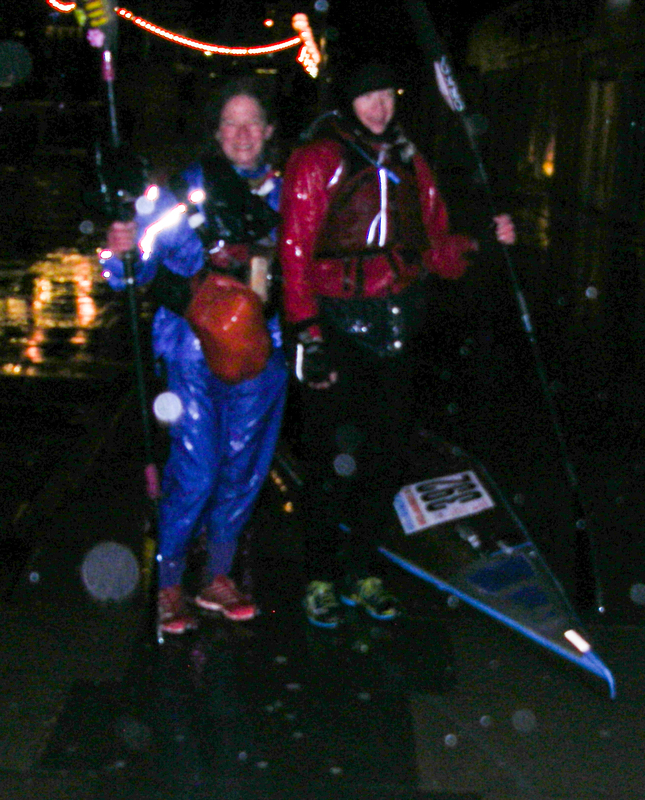 But Woo & Sarah are determined to continue and announce that they’ll walk all the way to Westminster. In normal circumstances after Teddington all you do is wave at the crew from a few bridges as they whoosh on down the tideway and I hadn’t planned on re-supplying them, so it’s back to studying the map, relying on Sat Nav and navigating in dark and increasingly damp conditions. At Kew we park behind a car carrying “V” bars with “WOO” as part of the number plate. It is a sign. JJ is here too, we feed & water them and depart. Just past Barnes Bridge we find them almost by accident while I’m desperately looking for a parking place (as we drive away I spot the perfect place. Noted for next time). The wind is really starting to get up now, it is fully dark and raining. Next stop is Battersea Bridge. waiting parked up in a back street I muse on how wrong it may look to outsiders who saw an old man and a young woman trying to snooze in a car with a jumble-sale in the back. While I’m brewing more warm chocolate one of the hazards of relying on GPS tracking in built-up area emerges. nNamoi is following their progress on my tablet, which is tethered to my phone. Suddenly! Their position jumps they are almost here, we grab stuff and hustle off to the riverside to be greeted by newly built flats and temporary re-routing of the tow-path. Can’t see them, we go upstream, still nothing. A man is unloading his car. “Have you seen two women carrying a kayak?” “No” he replies, unfazed. probably happens all the time round here. Back in the car, Naomi checks the app, and I try to work out where to meet them. We cross the river to the north, along the Embankment and back over Chelsea Bridge. My driving is atrocious as the weather, and I can only imagine the number of tickets that will be following. The entrance gate to Battersea Park looks like a good place to park, but to my surprise the gateway is open and we drive into the park and halt in a flooded car park. Last time I was here I became an impromptu marshal at the 2005 Orienteering World Cup (I have the jacket to prove it). We are relieved to see their head torches bobbing along, and we get a rather grumpy greeting. It is howling a hoolie as we direct them the wrong way round MI5 (It turns out that part of the riverside path is locked up at night). They’ve now only got less than 4k left. We head off to the South Bank, and playing by the rules to the end I bypass the hospital and park up at the South Bank. It’s almost a kilometer back to Westminster Bridge and the event center in St Thomas’s, where we meet two marshals in hi-vis. They tell us this has become a minor internet sensation with people tracking them on the website & filling up the Race facebook timeline with comments and encouragements. One of their colleagues has crossed the river to go along the North bank while we walk upstream along the south bank for a bit before turning and hot footing it back to the bridge, through the underpass to the steps to find them posing for a photo taken by the marshal. It’s over. No peace for the wicked. Naomi & I pick up the kayak and take it back to the car. I can’t figure out why Naomi seems to be going in the wrong direction until I realise it is the wind driving us off-course. It’s more than a handful and I have no idea how they managed it. In the wind-tunnels of the south bank the wind must be over hurricane strength now. We get the kayak on the V bars and head back where they have changed into their dry kit which was in JJ’s vehicle. There are three lovely lovely people who have waited until 20 past midnight on Monday morning. It has been 40 hours 45 minutes and 21 seconds. But they finished. And it’s hot drinks around the heater and as much cake as you can eat. Emotional hugs and photographs. Now all we have to do is drive home. In a hurricane. With a kayak on the roof. It’s an abortive start as the kayak rocks alarmingly and we have to contact JJ in the other car for more straps. With the kayak on more securely, we drive back to Hampshire, swerving past fallen trees. Dropping Naomi off (who was awesome and wasn’t fazed by anything at all) I’m glad I don’t have to face her Dad! Dawn is breaking as we get home, still on GMT as the world wakes up on BST. And yes. I have had the call about next Easter. The decks have been cleared. 1 So what happened was this. At Boulters Lock they managed to forget a rucksack with sundry kit in it, including Sarah’s beloved mountain hat. Because there was a phone number in the ‘sac, the person who found it rang JJ and so he & Brian drove back to retrieve it rather than sleep up. Hence JJ’s reluctance to abandon Woo’s hat to the river, either. We have all become flotsam in the bitstream. For a geek I’m not a particularly early adopter of new technology, but then again if I’m not on the bleeding edge I am less likely to get cut. So, it has taken a while to get around to owning a tablet. Penury played its part as a fruit-based device is undeniably enviable, but noted by a small tax rebate and the enthusiastic recommendation of a colleague I went to the (very) dark side to purchase a T€$¢o Hudl2. £129 plus £7.99 for a 32 gig SD card, hard to resist. The price is presumably subsidised by the data harvesting from the supermarket’s apps and customisations. Thanks to I have removed the corporate apps, adjusted the security settings (yeah, right) and got it (more-or-less) to my liking. As I intend it to be a second-screen device I have my basic essentials of Firefox, Janetter, Sonos and Instagram. Without an Android version of Thunderbird I went for K-9 as my email client of choice. People with smaller hands may find holding it in portrait mode awkward, but it’s a good size and has an excellent screen and good sound. Last night I watched Iron Sky streamed from my NAS via BSPlayer and it was fine. It is WiFi only, but if I’m out of the house I have a phone, which is far more portable. The company where I am embedded like a thorn in the thumb has decided to embrace google by migrating their Microsoft Exchange email to Gmail, their Microsoft Office applications to google docs & sheets, their corporate file shares protected by Active Directory security to Google Drive. I am part of the “Product Validation” phase. This testing ignores the tenet I hold to be most true – test with bog-standard users on bog-standard hardware. Almost all the participants in this phase of the project are IT staff with Admin level access and exotic hardware. Most of the user base is on tatty laptops running Windows XP or using Thin Clients to connect to Citrix published desktops. There will be tears. Actually the situation will be further complicated by the fact that only 40% of the user-base will migrate, the others will remain, maybe forever on Microsoft. Already several things have become clear. Gmail has a very inefficient use of screen-space, you cannot access Multiple mailboxes simultaneously**, and the only way to prevent users sharing documents with strangers is to re-word the Computer Useage Policy and hope for the best. It has also shown how important it is to ruthlessly edit your Active Directory to keep it up-to-date, remove old accounts and un-necessary permissions. Fortunately, my main role in all of this has been to sit on the side-lines and shake my head sadly as I watch a very slow-motion train wreck, and practise my smug told-you-so smirk. ** OK you can, but not in a way that is convenient or that allows for a low-blood pressure lifestyle without recourse to using an email client which negates part of he reason for “going google” in the first place. This summer the skies over Britain have been host to the sight of not one, but two Avro Lancaster Bombers, that is, 100% of all the airworthy Avro Lancasters left, sharing the same patch of sky. For this to happen, a plane 70 years old had to hop across the Atlantic via Greenland & Iceland, so it is highly unlikely to be repeated. Therefore it was concomitant upon me to make efforts to enjoy the spectacle, therefore I planned visits to several Airshows with the back-up possibility of several others should something happen to ground one or other of the planes. I got lucky and on the first day of the Wings & Wheels event at Dunsfold aerodrome (home to The Stig) was presented with apparition I have reproduced above. A week later I attended RAFA Shoreham, but unfortunately V-RA (a.k.a Vera) The Canadian-based Lancaster had been grounded whilst they replaced an engine. I shall make further endeavours to see them again as our summer slips slowly into glorious early Autumn. Much has been made in the past few years of the various attempts to improve the “show” that is Formula 1. I am a fan, however, even I will admit that the racing has often been a dreary procession, but as a geek I can get my freak from the technology and engineering involved. What is not in doubt, is that the problem with F1 is due to the difficulty in overtaking. The cars aerodynamics are so highly optimised that there is no advantage to following another car and sitting in the “hole” of dirty air produced by the leading car and hence gaining a “tow” that could be used to overtake. So various rule tinkerings have been made to try and make overtaking easier, such as the Drag Reduction System on the rear wing (which only following cars can use), energy boosts from Kinetic Energy recovery Systems, tyres that degrade at varying rates, and this year, a change to Turbo-charged engines with even more KERS. But. But. But. I believe the problem is this: the cars are optomised to perform best in qualifying, because a fast car starting at the front can run away and hide, they are not optomised to pass other cars. So. I have been back working in an office now for four months. The good is that I find I like working alongside other people more than I expected. The bad is the traveling, the early starts and late finishes when your office is further away than the spare room. The ugly was the very surprise decision by the business to close the call center & rationalise a number of other central functions like accounts & HR and throw about a hundred other people out of work. Hidden Heathrow. Colne biodiversity park.